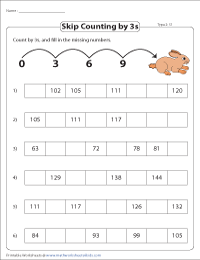 Skip counting serves as a foundation for addition and multiplication. 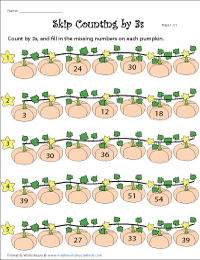 This page consists of worksheets on number lines and counting with objects by counting in 3s. 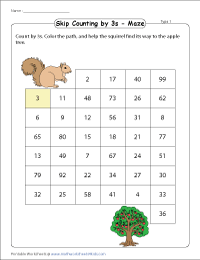 Math activities like mazes and connect the dots are available. Practice skip count by 3s with these printable worksheets. The display charts have a collection of interesting themes. The blank and partially filled charts can be used to test the students' ability to skip count by 3s. 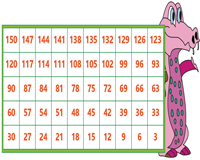 Encourage children to count back by 3s with the display charts. Reinforce the concept with blank charts and partially filled charts. 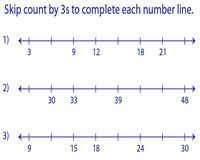 Fill in the missing numbers on each number line by skip counting in 3s. There are two levels in this section. Have fun with counting number in 3s with objects. Count the number of items in each set to find the total. 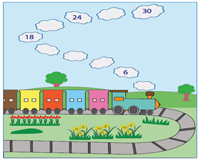 Fill in the missing numbers on each cloud of smoke let out by the toy train. Help John reach the island. Skip count by 3s to complete the path. A template is available here for each level. 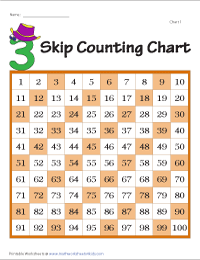 Skip count by 3s to fill in the missing numbers. 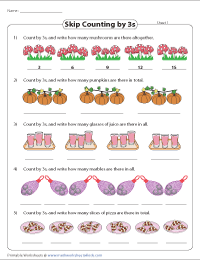 A pumpkin theme is used in these worksheets. The range of number varies from 3 - 60. The rabbit hops by 3s. Fill in the missing numbers. Each worksheet consists of six problems. 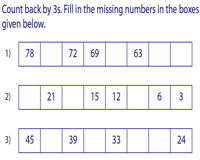 Fill in the missing numbers by counting back in 3s. Each worksheet consists of seven problems. A wide collection of mazes is available here with various themes. Skip count by 3s to solve each maze. 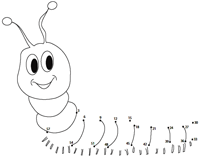 This section comprises of connecting dots worksheets. Join the dots to unlock the picture and color it. This activity develops the fine motor skills.